Most of the original bathroom remains in situ, although the toilet has been replaced. Traces of a high level cistern are present on the same wall (although do not show up very well photographically), in a different location to that indicated on the original building plans (which was on the same wall as the window). By the 1930s, low level toilets were more frequently installed indoors. The wall on the bath and cupboard walls have been tiled, and other walls painted, although the original paint is visible in places. This consists of a gloss cream or pale yellow paint, which corresponds with the colour remembered by one of the first occupants in later life (a child at the time), who informed a previous owner of this, and other information on the house. The bath exterior had been painted cream'; beneath this paint was a bright green gloss, which lay above a cream or pale green paint. The airing cupboard doors have been stripped, although a stain is present. It was uncertain whether or not this was original, and if so, whether the doors were painted over by the early occupants (as was more common). After removing the modern (1990s + vinyl), and what may be 1970s-80s (cork tiles) floor covering, a number of features were revealed. 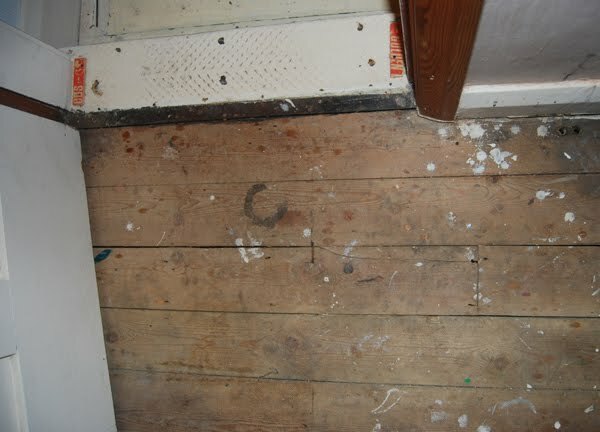 From beneath the cork tiles, a tin of dark stain (probably from the stairs) had been placed on the floorboards, suggesting that the bathroom floor was intended to be covered from the first phase of occupation. tThere were also lighter stains overlaying the stain from the stairs, and on the bathroom floorboards, suggesting that the cupboard doors may have been stained after the first phase, but before the cork tiles were laid. Green gloss paint from the bath exterior was splashed on the floorboards, suggesting that this should also date to before the cork tiles. century buildings, this is very helpful to understand our culture. Sounds very interesting! I'd certainly like to hear more about this. I'm (very slowly, due to other commitments) writing a paper looking at social identities & use of domestic space in inter-war Britain (see: http://independent.academia.edu/KirstenJarrett/papers). Otherwise, I can be contacted through Academia: I'd be grateful if you could keep me informed of your research, as it sounds just the sort of thing that I'd find useful. Not sure if I've posted this yet, but I'm hoping I still have a photo (or drawing) of a great bit of graffiti from Lymehurst (which seems to have been done during a phase of redecoration - I can't remember if this was in biro, which would've at least given a TPQ), which might be described as a 'contestation of gender relationships'! I'll see if I can find it.